Located right on the sands of Tuban Resort, South Kuta, only minutes away from the airport, the hotel overlooks the dazzling blue ocean and is surrounded by acres of unspoiled tropical gardens. 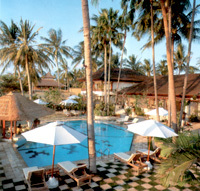 Hotel Santika Beach Bali offers Balinese hospitality, world class service and unbeatable comfort. Art Market, Boutiques, Art Shops, Mall, nightspots and public transportation can be found just around the corner. Rooms in two or three storey building, private Bungalows and Suites are all harmoniously situated within the luxurious gardens. There are 60 Superior Rooms [32 Double & 28 Twin], 68 Deluxe Rooms [28 Double & 40 Twin], 16 Executive Bungalows [11 Double & 5 Twin], 16 Family Suites [each fit for 4 adults or 3 adults with 2 children], 10 Junior Suites [1 bedroom beachfront and pool] and 1 Presidential Suite [1 double & 1 triple with private swimming pool]. 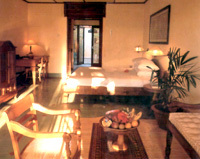 Suite area has private swimming pool. Each room has individual air conditioned, terrace, tea and coffee making facilities, hair dryer, hot and cold water, mini bar, IDD telephone, taped music selection, satellite TV, in-house movies, and spacious bathroom. 2 Outdoor Swimming Pool with Children's Pool at each, Private Swimming Pool at Suite area, 3 Restaurants, Bars, Lobby Lounge, Tennis Court, Table Tennis, Games equipment, Children's Playground, Massage, Daily Guest Activities, Function and Meeting Rooms, Open Stage, Laundry & Dry Cleaning Service, Safe Deposit Boxes, Newspapers, Library, Baby Cots, 24 hours Room Service, 24 hours Security, Interconnecting Rooms and Ample Parking Space. Baby Sitter, Souvenir Shop, Drugstore, Tour Booking, Taxi Counter, Car Rental, Doctor on Call 24 hours, Facsimile Service, Currency Exchange and Watersport Facilities. 4 Nights accommodations at Premiere Room, Sunset Dinner Cruise, 2 hours Lulur spa treatment for Couple, Photo of Balinese wedding Costume; Bedugul Tanah Lot Day Tour; Lunch and dinner in the top restaurants; Uluwatu Tour; Kecak Dance and jimbaran BBQ Seafood cafe; Watersport (Package of Parasailing, Banana Boat and Jet-Ski) and Free time with your Spouse, Return Airport Transfer, Air-conditioned Car with Guide at your choice or languages.